When reading the book of Job, I was looking at what Job’s friends did right and wrong. But I noticed not only the friends’ actions, but also Job’s reaction. How did he deal with these friends who kept accusing him of sin and judging him? And how could I learn from his example? Things got pretty bad between Job and his friends. My relatives have failed me, my close friends have forgotten me (Job 19:14). My friends scorn me; my eye pours out tears to God (Job 16:20). I am a laughingstock to my friends; I, who called to God and he answered me, a just and blameless man, am a laughingstock (Job 12:4). Job and God have a long conversation that ends with Job admitting that it took a period of suffering for him to really know God, “I had heard of you by the hearing of the ear, but now my eye sees you” (42:5). God responds with words for Job’s friends and Job himself. After the Lord had spoken these words to Job, the Lord said to Eliphaz the Temanite: “My anger burns against you and against your two friends, for you have not spoken of me what is right, as my servant Job has. Now therefore take seven bulls and seven rams and go to my servant Job and offer up a burnt offering for yourselves. And my servant Job shall pray for you, for I will accept his prayer not to deal with you according to your folly. For you have not spoken of me what is right, as my servant Job has.” So Eliphaz the Temanite and Bildad the Shuhite and Zophar the Naamathite went and did what the Lord had told them, and the Lord accepted Job’s prayer. If it were me, praying for them would be the last thing I would want to do. I would rather pout. And ignore them. And talk behind their backs about what awful friends they are. But that’s not the example of Job. And that’s not the teaching of the Bible. It wasn’t until Job prayed for his friends that his suffering ended. Job 42:10 says, “And the Lord restored the fortunes of Job, when he had prayed for his friends. And the Lord gave Job twice as much as he had before.” I had never noticed that before. It wasn’t until Job prayed for his friends that everything was restored to him. Job healed his relationship with God and also healed his relationship with his friends. That’s when he was blessed again. 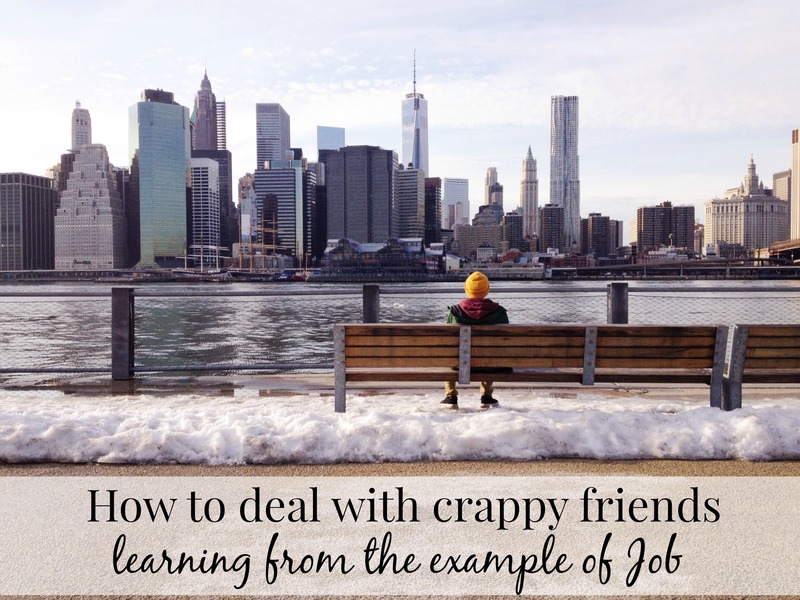 So what can we learn about dealing with crappy friends from the example of Job? We can remain blameless by continuing to love them. We can forgive them for the wrongs we feel they have done. We can pray for them. God will honor our obedience to Him as we love our friends.